I found a musket ball about 7 inches underground and I am researching the possibilities of its use and in what weapons it may have been used in. The size of the ball is .65 cal - .93 oz or 408.96 grains. Its not steel, the thin coating you see is from the black soil in my yard. My home town has been a coal town since the early 1900s and still is. The ball is not magnetic at all, so it is not steel. There were a few settlers from the revolutionary war that lived close to my home and plenty of Union soldiers from the same area. The hill I live on was a farm in the late 1800s (Shaffer Farm) and I believe that the farmer may have lost this ball or one of these soldiers lost it. I live 13 miles north of Old Forbes Road and am also surrounded by two popular Indian trails, the closest one of these is 8 miles to the north. Anyone from a soldier, fur trader, Indian may have lost this ball. Chuck, those CCC Camps offer a great opportunity to find some silver. You need to do the research to find them, bet it's well worth the effort. Definitely, post those pics of finds! Thanks Frank! Last weekend a friend of mine took me to the CCC Camp and Blue Knob State park here in PA and it was an adventure for sure, as my son and I locked ourselves out of our car, before getting the detector out :( but it was a good day. My friend showed us an old kiln from the camp and some foundations. We plan on going back out with him to the same area at some point this year to detect on some of the ghost town areas at or around the same location, where people used to live before being kicked out by the CCC Camps. If we find anything good, I will post some pictures and let you know. Chuck thanks for the post. 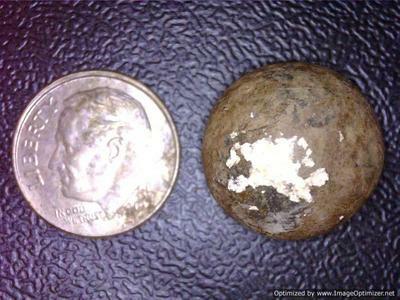 That musket ball could be Revolutionary War era. We have found many of the same type at Revolutionary War sights in the NE. They vary in size, and in metal content. Different metals were used because of the scarcity of raw material before and during the war. They used whatever metal was available to get through the war. Also, many of the Revolutionary War soldiers returned home with the balls and other items. Just like after the Civil War. It could have been dropped, or shot by a returning soldier, on his property.